It should have been October 31, shouldn’t it? From the very moment that a new account of the life and art of Edward Gorey was announced, Halloween hungered for the book—working the phones, dropping by the other day's houses for none-too-subtle campaign visits, taking out ads in the trade publications. All to no avail. Either unnoticing or uncaring, the publisher Little, Brown set November 6 for the book's release, skipping past the disappointed Halloween. Skipping past the disgruntled All Saints' and All Souls', for that matter, either of which could have claimed Gorey's macabre humor as its own. But here the book comes, looming into sight at last, and perhaps the beginning of November is not an inappropriate moment to contemplate the author of such works as The Evil Garden and The Pious Infant. November 6 is the feast day of Saints Atticus and Felix of Thynissa, after all—gruesomely martyred. It's the feast of the Gorey-esquely named Saints Pinnock and Erlafrid, for that matter. And it's also Election Day, which has its own form of morbid comedy for those willing to contemplate it. The author of books on everything from Glam Rock to online savagery, Mark Dery is a curious choice for a chronicler of Edward Gorey, and he reportedly took seven years to decide how to think about the peculiarities of the grisly cartoonist. The result seems worth the wait. Born to Be Posthumous: The Eccentric Life and Mysterious Genius of Edward Gorey contains more than most probably wanted to know about the man. But building his text from pouring over Gorey's letters, Mark Dery makes a convincing case that Gorey came by his eccentric drawings honestly: He was quite as peculiar in life as he was in work. Gorey seems always to have tried to present himself as a man out of time. His attempts in his 1940s Harvard days to look like a young Edwardian gave way to attempts in the 1970s to parade through New York in a raccoon coat and a carefully combed beard he seemed to have copied from the 19th-century captain of a clipper ship. Born in 1925, he spent the 75 years before his death in 2000 striving to have the kind of outward perfection of a Victorian aesthete (Oscar Wilde was an obvious role model), while at the same time Gorey strove to make his private life as invisible and even nonexistent as possible. When he was a young man, he would respond to personal questions with disquisitions on Diaghilev's Ballets Russes. In the 1980s, he would explain the use of wallpaper in soap operas. In the 1990s, he would expound on Buffy the Vampire Slayer. The modern obsession with sexual orientation serves Dery ill in Born to Be Posthumous. He's as careful as he can be, but he feels pressure to put one checkmark or another next to Gorey's name, when, in fact, the man is probably best described by the old term that would have been understood by readers of Sherlock Holmes: a bachelor. Undersexed or overscrupulous, Gorey rarely seems to have acted on a sexual attraction, and he lived as private a life as a man can with a large circle of friends and a flamboyant public persona. Of course, bachelor is a yet another of those Victorian self-presentations that fascinated Gorey, and why wouldn't he have embraced in life what his art sought to capture? And the art is the point, with Edward Gorey. He wrote over a hundred small books of his drawings, and he illustrated dozens of works by others: Samuel Beckett's fiction, for example, together with T.S. Eliot's practical cats and Muriel Spark's mementos mortem. All of that was appropriate for his crosshatching art, but other authors Gorey illustrated are even more revealing: Edward Lear's nonsense verse, Gilbert & Sullivan's comic operettas, Hilaire Belloc's gleefully perverse children's poetry, Bram Stoker's Dracula. 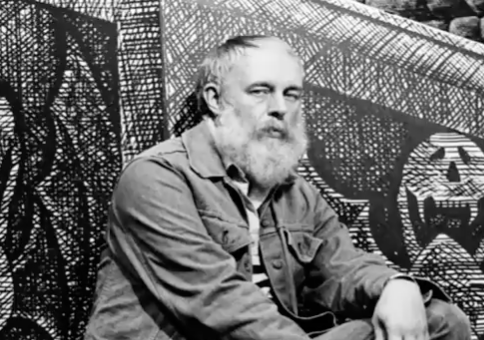 Edward Gorey is often viewed by critics as though he stepped straight out of The Yellow Book: a throwback to the Decadents of the 1890s, a man who came late to the party of Aubrey Beardsley, Max Beerbohm, Baron Corvo, and the rest. And it's not a bad way to understand Gorey. The criminally neglected Ronald Firbank—whom, if you haven't read, you should—has a clear relation to Gorey. But if there is a single line from which Edward Gorey's humor descends, it's the minor but irrepressible set of sly humorists in the decades before Oscar Wilde—the droll Victorians at the peak of British confidence. W.S. Gilbert and Edward Lear. Dickens, too, on occasion. Lewis Carroll. The impulse that in French expressed itself as surrealism took in English the form of nonsense. And from that fact alone, an entire critique of culture can be constructed. The most easily accessible places to go for his work are the anthologies he published, each collecting several of his small illustrated stories: Amphigorey, Amphigorey Too, Amphigorey Also, and Amphigorey Again. But like the older Charles Addams—another Victorian-phile comic cartoonist with a flair for the cadaverous—Gorey is probably best known for the work that burst into public notice from other sources. The 1977 revival of Dracula on Broadway, for example, which featured sets and costumes he designed to reflect his cartoons. The 1980 credits for the PBS series Mystery!, with animations of his long, thin human figures in Edwardian dress and the spooky settings of a lost Britain he loved (without ever having seen): oversized garden urns, stone mansions, strangely trimmed plants, and gray skies. You can see his influence in Neil Gaiman's graphic novels and in both the text and the illustrations of Lemony Snicket's bestselling Series of Unfortunate Events. Such Tim Burton movies as The Nightmare Before Christmas and Corpse Bride borrow heavily from Gorey's palette and visual toolkit. The Goth role players owe him a debt, as well. Gothic fiction had an 18th-century vogue, from Horace Walpole's 1764 Castle of Otranto to Jane Austen's parody of the genre in her 1803 Northanger Abbey—and it's interesting that when these authors sought the spooky and the macabre, they looked to the remnants of the Middle Ages, the bare ruined choirs of Gothic architecture. When the second half of the 20th century sought similar effects, whether for comic or serious purpose, it looked instead to the gaslight era of the late Victorians and Edwardians. And of all those drawn back by this impulse, Edward Gorey remains the most satisfying. The most aesthetic, the most nonsensical, the most sly.